Providing you the best range of deep bed filter column apparatus with effective & timely delivery. Compressed air supply 10 LPM at 2 BAR. Flow 0.5 to 5 L/min. 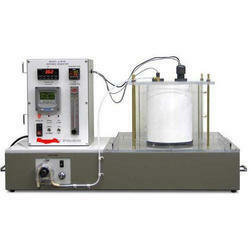 We are offering a wide range of Deep Bed Filter Column Apparatus. complete with 2 Nos. of feed tanks. A centrifugal pump is provided to circulate the water through the column. Water supplied to the column is regulated and controlled by Rota meter. To study the increase in loss of head with respect to time in the filter bed. Looking for “IC Engine Testing”?